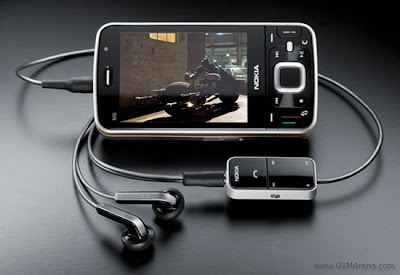 Nokia's highly-anticipated N96 smartphone started shipping last week, Nokia said on Wednesday. The N96 is the company's new flagship model and it is now available in selected countries in Europe, the Middle East, Africa, Asia Pacific, and China. The handset will retail for about $795 before taxes and carrier subsidies. A version for North America is expected in the fourth quarter, for about $895. The smartphone is powered by Symbian OS v9.6 S60, a version of theOS that has been optimized for multimedia applications as well as security. The handset measures in at about 4.1 by 2.1 by 0.7 inches, and it weighs 125 grams. The handset has many features for the mobile professional. It's capable of push e-mail and instant messaging, and there's an Office documentviewer built-in. Users can also surf the Web with the HTML browser and check the news on the RSS reader. Workers on the go also have multiple ways to connect, as the N96 has integrated Wi-Fi, EDGE, and 3G support up to 3.6-Mbps downlink speed. There's also built-in GPS that can use cellular data for location-based services like search and navigation. But this smartphone is not just for work, as Nokia is emphasizing the handset's multimedia functions. The N96 is capable of playing multiple codecs of music and video, has a stereo FM radio, and is capable of receiving DVB-H mobile television. Users will be able to store the media on the 16 GB of internal memory, and that can be expanded up to 8 GB via the microUSB slot. The handset also has a dual slider design and it sports a 2.8-inch screen that can automatically adjust depending on how the user is holding it. There also a 5-megapixel camera that has Carl Zeiss optics, autofocus, video recording capability, and a flash. I m certainly off to get one for myself. Will blog on it once i have completed my own evaluation and will let you know whether the new N96 lives up to my expectation. Although not quite as groundbreaking as the N95, the N96 still adds plenty of new features inside its modern casing, so expect this to be instantly popular.